Posted 2 January 2011 in Bonus, Cooke Looks, Mister Miracle #2. While the interior story is mildly formulaic, Granny Goodness proves an awesome villain (and so is the freakish Overlord despite the one-shot appearance), and I believe the issue is, overall, a vast improvement over #1. 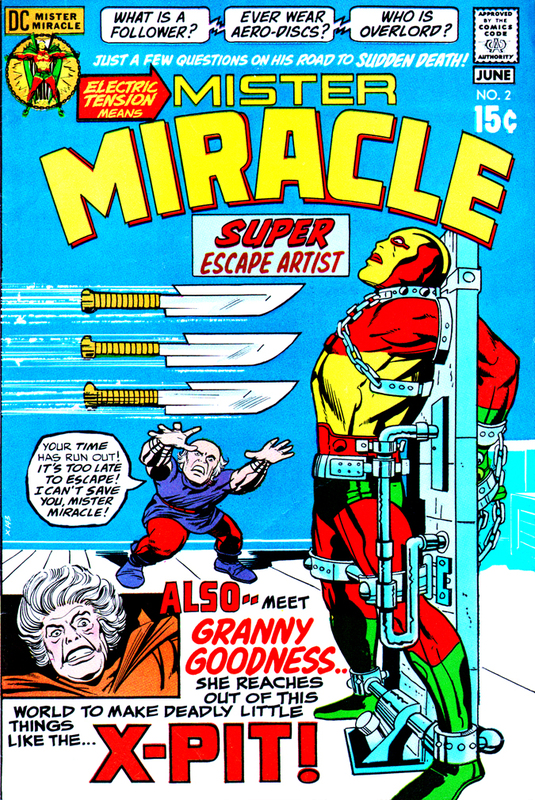 Granny is shallow, vain, greedy and even needy, yet always impressive, and researching her entry, it’s obvious she is as much the quintessential nemesis in this title as Desaad is to The Forever People. Her obsession with Scott Free is all-consuming and, as becomes obvious, she refuses to get over his escape from Apokolips and that will doubtless be the cause of her eventual downfall. There are a couple of other delightful touches in this story, as well, including the bonding of Oberon and Scott Free — particularly when they shake hands after the assistant plies for background information and Oberon notes, “There’s a haunting look of fear in your eyes — and pain! Say no more! I know you as a brave and sincere, young friend!” Replies Scott, “Thank you, Oberon! You’re a big man — the kind one looks up to!”; and when Mister Miracle holds his pal over his head when the mud rises in the X-Pit. The other moment is when Scott revives his Mother Box who has suffered an attack of Overlord. “I haven’t explained Mother Box to you, Oberon — but she is dear to me — and I must help her!” Scott tells his friend. Oberon retorts, “Y-you mean that thing — is alive?” Scott puts his hands to his forehead and concentrates on his sentient computer: “In a way, she is! But, now, she’s hurt — weak — I must pour out my love — my belief — to make her respond!” Great stuff!